Copiague (/ˈkoʊpeɪɡ/ KOH-payg) is a hamlet on Long Island (and census-designated place) in Suffolk County, New York, United States. The population was 22,993 at the 2010 census. Copiague is an unincorporated place within the Town of Babylon. Copiague is located at 40°40′29″N 73°23′36″W﻿ / ﻿40.67472°N 73.39333°W﻿ / 40.67472; -73.39333 (40.674700, -73.393235). 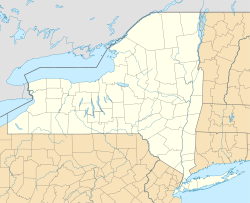 It is approximately 35 miles (56 km) east of Manhattan and 70 miles (110 km) west of Montauk Point. According to the United States Census Bureau, the CDP has a total area of 3.2 square miles (8.4 km2), of which 3.2 square miles (8.3 km2) is land and 0.04 square miles (0.1 km2), or 0.88%, is water. Copiague is bordered by Amityville to the west, North Amityville to the north, Lindenhurst to the east, and the Great South Bay to the south. The southwestern peninsula is known as Amity Harbor and is served by the Amityville Post Office. The central peninsula is known as Copiague Harbor and is served by the Copiague Post Office. The southeastern peninsula is known as Venice and is served by the Lindenhurst Post Office. As of the census of 2010, there were 22,993 people and 7,535 households, with 3.04 persons per household. The population density was 7,185.3 per square mile (2,770.2/km²). There were 7,919 housing units, of which 82.0% were owner-occupied. 4.8% of housing units were vacant and 28.0% of occupied housing units were occupied by renters. The racial makeup of the CDP was 83.5% White, 7.6% African American, 0.3% Native American, 2.2% Asian, 0.0% Pacific Islander, 13.0% some other race, and 3.5% from two or more races. Hispanic or Latino of any race were 32.7% of the population. The CDP was 57.3% non-Hispanic White. There were 7,535 households, out of which 29.2% had children under the age of 18 living with them, 49.2% were headed by married couples living together, 14.9% had a female householder with no husband present, and 28.4% were non-families. 21.4% of all households were made up of individuals and 8.9% were someone living alone who was 65 years of age or older. The average household size was 3.04 and the average family size was 3.44. In the CDP, the population was spread out with 21.2% under the age of 18, 9.2% from 18 to 24, 29.6% from 25 to 44, 28.1% from 45 to 64, and 11.7% who were 65 years of age or older. The median age was 38.4 years. For the period 2009-2011, it was estimated that 94.9% of the population had lived in the same house 1 year and over. 29.2% of the population were foreign-born, and 34.8% of residents at least 5 years old spoke a language other than English at home. Between 2009 and 2011, 84.9% of residents at least 25 years old had graduated from high school, and 20.9% of residents at least 25 years old had a bachelor's degree or higher. The mean travel time to work for workers aged 16 and over was 25.1 minutes. For the period 2009-2011, the median annual income for a household in the CDP was $74,065. The per capita income for the CDP was $29,768. 7.8% of the population were below the poverty line. Most of Copiague is served by the Copiague Union Free School District, which also serves most of North Amityville, a small portion of North Lindenhurst, and a very small portion of East Farmingdale. However, a portion of Copiague, west of Bayview Avenue and north of Dixon Avenue, is in the Amityville Union Free School District. Dancing Guy on Oak St.
^ a b "Geographic Identifiers: 2010 Demographic Profile Data (G001): Copiague CDP, New York". U.S. Census Bureau, American Factfinder. Retrieved 2012-12-26. ^ a b c d e "Profile of General Population and Housing Characteristics: 2010 Demographic Profile Data (DP-1): Copiague CDP, New York". U.S. Census Bureau, American Factfinder. Retrieved 2012-12-26. ^ a b "Selected Social Characteristics in the United States: 2009-2011 American Community Survey 3-Year Estimates (DP02): Copiague CDP, New York". U.S. Census Bureau, American Factfinder. Retrieved 2012-12-26. ^ a b "Selected Economic Characteristics: 2009-2011 American Community Survey 3-Year Estimates (DP03): Copiague CDP, New York". U.S. Census Bureau, American Factfinder. Retrieved 2012-12-26. This page was last edited on 20 March 2019, at 21:23 (UTC).